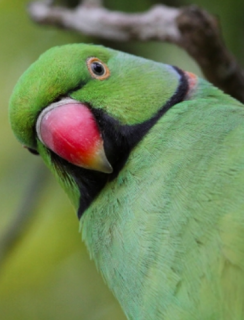 The Echo Parakeet differs from most Asian and African parakeets by being bright emerald green rather than olive green. Male-color generally emerald to grass green, with yellowish underparts and underwings. Black thin line from cere to eyes, broad moustache-like stripes on lower cheeks and chin out to sides of neck, and narrow black neck-stripes bordered by blue patches over ears and neck and below by pink lines going to hindneck. Upper beak red, lower black. Eye pale yellow. Female-plainer with all black beak, no head markings; shorter tail. As in adult female, but tail short; bill coral/pink in very young individuals. Low call cha-chaachaa at a rate of two notes/second interspersed with harsher notes. High pitched call when excited or in flight. Bark in alarm. Also melodious purring or whistling. V. Tatayah in litt. 2012. Carl Jones in litt. 2005. Some captive breeding (hand-rearing) for re-introduction in the wild; otherwise not raised in captivity. Gerald Durrell Endangered Wildlife Sanctuary (GDEWS). Birds at Plaine Lievre (field station used by Mauritian Wildlife Foundation in Black River Gorges Nat'l Park) are supplemented with pelleted food. Provided with local foods and browse. Next hollows at least 50cm (19.5 in) deep and 20cm (7.8 in) wide. Severe deforestation and degradation of habitat, as well as introduced rats and crab-eating macaques, and the effects of disease and storms. Found on Mauritius, formerly on Reunion. Upland forest, lower-level scrub forest. Relies solely on native plants; introduced plants not taken. Buds, young shoots, leaves, flowers, fruits, seeds, twigs, sap and bark. Thought to favour communal roosting. Relies solely on native foods. Generally solitary or in pairs during breeding season. 2-3 eggs, 33.0 x 26.0mm (1.3 x 1 in). Late September to early October start.